Kleinert's Solutions For Sweat & Odor Control: Why Do We Sweat More In The Summer? People typically sweat more in summer than winter because the temperature is hotter (combination of the heat and humidity) and the body overheats more easily. The humidity is the amount of water vapor that's currently in the air. Water vapor is what makes us feel hot and sweaty. High humidity and high heat combined together is why we sweat. 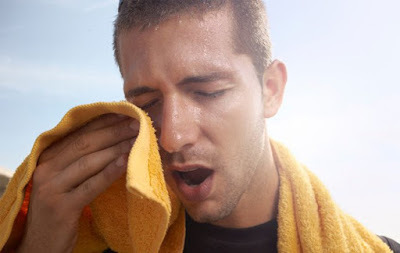 Our bodies sensing when we get hot trigger sweat glands that release a watery substance that’s the foundation of sweat. When sweat is released onto the skin and is exposed to the air, it will evaporate and ultimately help to cool down the body and lower our body temperatures. It is harder to cool off in humid climates because the sweat can't evaporate very fast but in dry climates such as arizona you actually feel cooler when you sweat because it evaporates off of you causing your skin to cool off. Sweating is a natural occurrence in our body and if we did not sweat our bodies would be in trouble because they would overheat internally and that could possibly lead to death if not cared for quickly. If you do not sweat in hot conditions you need to find the reason why because that is abnormal. So in essence we all sweat but many sweat more than others due to genetics, circumstances, climate and more. Since we don’t like to see sweat stains or smell the foul odor we at Kleinert’s develop a variety of products to guard and control sweat. Some examples of our products are Sweat Shield Clinical Antiperspirant Wipes, Disposable Underarm Pads, Washable Dress Shields and Washable Garment Shields, Sweatproof Undershirts, Dry Feet Products, Bedding Protection and more. Visit our website today www.kleinerts.com to learn more and purchase products. We have been serving the public with our products since 1869 and when invented the dress shield category and created the first baby pant and many more products throughout the years. You can trust the Kleinert’s brand and quality.